MAG Ireland (The Irish Motorcyclists’ Association) is urging riders to participate in Irish Road Safety Week which runs from Monday 3rd to Sunday 9th October 2016. The following information has been provided by the RSA. 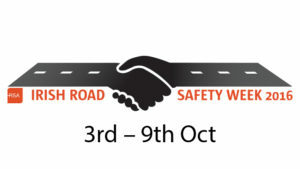 This year, Irish Road Safety Week (IRSW) will be taking place from Monday 3 October to Sunday 9 October with lots of road safety activities planned nationwide. We’re looking for your help with this national drive to save lives, so if there are events happening in your community, get involved and help to save lives on our roads. We also want to hear what you’re doing to support Irish Road Safety Week in your community, school or workplace, so send the details to campaigns@rsa.ie and we’ll post them on this page. We look forward to working with you to help save lives and prevent serious injuries on our roads. On Monday 3 October, the RSA will host its Annual Academic Lecture in the Ballroom Farmleigh, Phoenix Park. The theme of this year’s lecture is motorcycle safety and will be attended by a wide variety of road safety stakeholders. On Wednesday 5 October: The RSA and the Irish Tyre Industry Association (ITIA) will jointly run Tyre Safety Day where free tyre checks will be on offer to motorists in participating garages. More information will be onwww.ITIA.ie . There will also be a tyre safety radio campaign airing during the week. A copy of ‘Your guide to Tyre Safety’ which includes information on buying second hand tyres can be downloaded here. The RSA, HSA and An Garda Síochána are hosting a Driving for Work Seminar on ‘Managing Driving for Work’ on Wednesday 5 October in Rochestown Park Hotel, Douglas, Co Cork from 8.30am to 1pm. Places are limited so email drivingforwork@rsa.ie to register your pace by Friday 30 September. The second Driving for work Seminar hosted by the RSA, HSA and An Garda Síochána ‘Managing Driving for Work’ will be on Thursday 6 October in Green Isle Hotel, Naas Road, Dublin from 8.30am to 1pm. Places are limited so email drivingforwork@rsa.ie to register your pace by Friday 30 September. National “Beep Beep Day” takes place on Friday 7 October 2016. Beep Beep Day is a chance for Pre-schoolers to get involved in road safety. Please place your orders through the RSA Online Orders systemhere in plenty of time to have you packs in time. We have limited supply of stocks so place your orders as soon as possible. During Irish Road Safety Week, the RSA will be broadcasting its ‘Is Your Car Ready for Winter?’ radio ad to remind road-users to maintain their cars, especially in wet and windy weather. There will be free giveaways on the RSA’s Facebook and Twitter pages. The RSA ‘StreetSmart’ brings road safety to life in a fun way for young children aged between 4 and 12. Using a ‘streetscape’ map, children wander the street scene and learn more about important road safety skills. StreetSmart will be in Cork City Hall from 3 -6 October. Check it Fits, the RSA’s free child car seat checking service, will be visiting Waterford during Irish Road Safety Week to give free car seat checks and advice to parents and guardians. It will be in Lisduggan S.C, Waterford Retail Park on Thursday 6 October and Super Valu, The Kilbarry Centre, Tramore Road on Friday 7 October from 10am to 5.30pm. For more details on the locations please visit the Check it Fits section of our website here. In October, the RSA will also be distributing its ‘Back to School’ pack to secondary students, while Seatbelt Sheriff and Hi Glo Silver will be making an appearance at primary level. Our National Road Safety Education Service will be travelling the length and breadth of the the country, delivering road safety education programmes to crèches, schools, universities, workplaces and communities throughout the week. The following is a list of activity that has been arranged in Counties around the country for Road Safety Week.